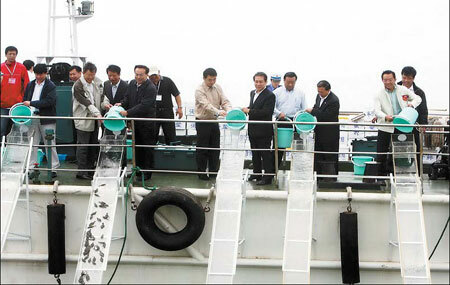 Staff of the Qingdao Ocean and Fishery Bureau release fish fry into the sea to help restore fisheries. Rapidly developing and increasingly valuable, Qingdao's marine economy has evolved into a mainstay of the coastal city in Shandong province. "Qingdao will make good use of the marine wealth and advantages provided by research to develop a sound and beneficial marine economy," Zhang Yuanfu, vice-mayor of Qingdao, told China Daily. Zhang predicted that total revenues from marine economy - including fishing, aquatic cultivation, offshore oil, shipping, shipbuilding and marine environmental protection - will reach 127 billion yuan this year. The marine economy had strong momentum over the past five years, increasing 20 percent on average each year. According to the 11th Five-Year Plan (2006-10) for the city's marine economy, its total production value will hit 210 billion yuan in 2010, accounting for 19 percent of the city's gross domestic product. Qingdao has laid plans to be a top marine economy in China through rapid and healthy growth in technology research, shipping, fishing, offshore oil production and shipbuilding. To improve environmental protection for its surrounding ocean, the city has invested 660 million yuan in the past five years to treat effluent produced along the coastline. More than 17 million yuan was spent on enhancing the environment of Jiaozhou Bay, including establishment of a number of marine nature reserves. The city has also improved its capacity to monitor water quality to maintain a sound maritime environment. The city's efforts paid off. It was awarded with a top national prize for marine protection in 2006. The busy shipping hub of Qingdao port now has trade links with more than 450 ports in some 130 countries and regions. Total throughput of Qingdao port reached 265 million tons in 2007 as a record-high 9 million TEUs (20-foot equivalent units) were handled. Its volume in containers, crude oil and ore were among the top three in China. Grasping the opportunity presented by the upcoming 2008 Olympic Games, the city has rapidly developed its coastal tourism. Last year it hosted more than 30 million visitors. In a bid to expand the market for its seafood at home and abroad, the city has adopted more advanced approaches to fishing. Its seafood is now exported to more than 30 countries and regions including South Korea and Japan. Total revenues from seafood exports exceeded 1.5 billion yuan in 2007. Shipbuilding, marine-based biological pharmaceuticals and new materials developed from the ocean and seabed have also seen rapid development. By 2010 Qingdao is expected to have an annual shipbuilding capacity of 2 million tons. The city now desalinates and uses 885 million cu m of seawater annually. Its comprehensive use of ocean resources makes it a model in the nation, according to Qingdao officials. More than 300 hi-tech enterprises engaged in marine biological pharmaceuticals, seafood and marine-based new materials are now a driving force for the city's marine economy.